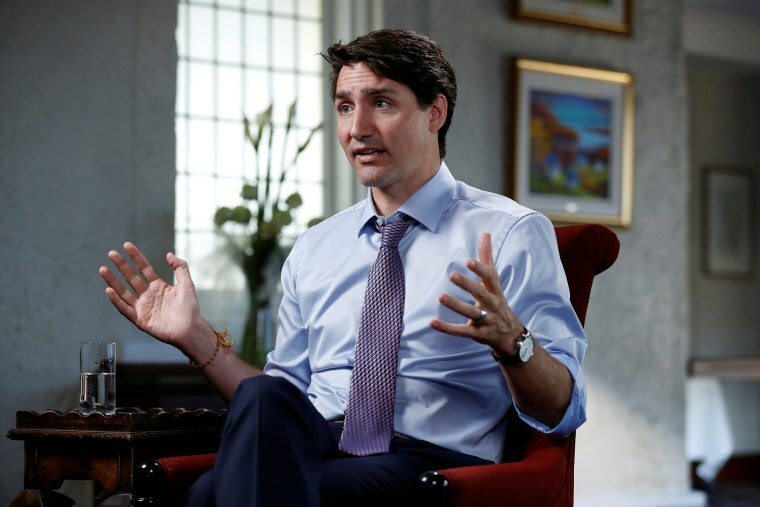 The Canadian prime minister criticized the administration in an exclusive interview with "Meet the Press" moderator Chuck Todd. Trudeau on Trump tariffs: 'Insulting and unacceptable' that Canada seen as threat to U.S.
"The idea that the Canadian steel that's in military, military vehicles in the United States, the Canadian aluminum that makes your, your fighter jets is somehow now a threat?" he continued in the interview, which took place in Trudeau's office in Parliament in the Canadian capital of Ottawa. "The idea that we are somehow a national security threat to the United States is quite frankly insulting and unacceptable." After the U.S. announced tariffs on Thursday, Canada responded with retaliatory tariffs, taking "the strongest trade action Canada has taken in the post-war era," according to Canadian Foreign Affairs Minister Chrystia Freeland, while Trudeau said "we have to believe that at some point their common sense will prevail. But we see no sign of that in this action today by the U.S. administration." In the interview with NBC News, Trudeau pushed back against Trump's characterization that the U.S. is plagued by unfair trade deals. "He's worried about trade surpluses, trade deficits around the world. Well, they have a $2 billion surplus on steel with us. So it's not like the trade is imbalanced against the U.S. favor on this one,” Trudeau said. The full interview with Trudeau will air Sunday on "Meet the Press with Chuck Todd."